Rock & Roll changed 1950s America at 45 revolutions per minute. 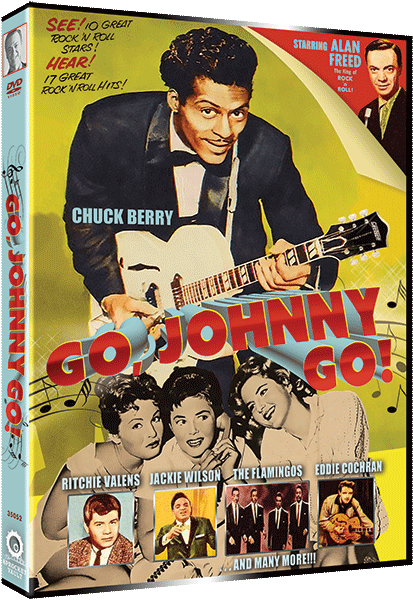 The swinging-est of the R&R movies was the electrifying Go, Johnny, Go!, which has been seldom seen since its 1959 release, and never in such quality as the high-definition DVD version just released by The Sprocket Vault and sold exclusively through Amazon. A musical promoter, played by legendary D.J. Alan Freed, searches for the next big star whom he plans to name “Johnny Melody,” and as with rock and roll movies of that era, the storyline is little more than a loose frame to hang musical numbers on. Chuck Berry, Ritchie Valens, Jimmy Clanton, Jackie Wilson, Eddie Cochran, Harvey Fuqua, Jo-Ann Campbell, The Cadillacs, The Flamingos and Jimmy Cavallo. Many, including Ritchie Valens only film appearance, you won’t see elsewhere. When The Sprocket Vault acquired the DVD rights to this rock and roll classic it had no idea the original film elements were in such disarray, and more than once feared the project would have to be aborted. Fortunately some mislabeled cans of film re-surfaced turning out to be the original camera negative form which restoration experts were able to create a beautiful, clear, sharp high definition wide screen transfer. The supplemental audio commentary is by film historians Richard M. Roberts, Randy Skretvedt, and Brent Walker, who share fascinating facts and historical information. sprocket_admin No description. Please update your profile.